The actress Clementine Plessner was born as Clementine Folkmann in Vienna. She began her artistic career as a singer, later followed engagements as an actress at different theaters. 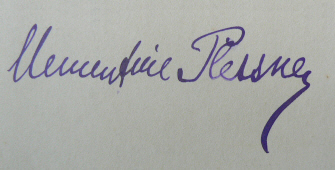 Clementine Plessner took regularly part in movies from 1917, among them "Giovannis Rache" (17), "Der Weg, der zur Verdammnis führt" (18), "Das Tagebuch einer Verlorenen" (18), "Henriette Jacoby" (18), "Anders als die Anderen" (19) and "Störtebeker" (19). She became a demanded film actress in the 20s and Clementine Plessener appeared in some important productions but also entertainment movies. To her well-known movies of those years belong "Manolescus Memoiren" (20), "Der Gang in die Nacht" (21), "Lady Hamilton" (21), "Lucrezia Borgia" (22), "Bigamie" (22), "Taras Bulba" (24), "Der Hauptmann von Köpenick" (26), "Überflüssige Menschen" (26) and "Der Monte Christo von Prag" (29). Clementine Plessner impersonated her last roles at the beginning of the 30s in the productions "Der Wilddieb" (30), "Stürmisch die Nacht" (31) and "Theodord Körner" (32). The film career of the Jew Clementine Plessner ended with the rise of the National Socialism. She went back to Austria where she got arrested in 1942. She was deported to the KZ Theresienstadt in same years and one year later she was murdered at the age of 87.